As a physical education teacher in Pedagaruvu village of Araku in Andhra Pradesh, Gangamma monitors the diet and physical activities of her students every day and encourages them to stay healthy. The determined young girl has an air of confidence about her as she goes about ensuring girls under her charge are fit enough to take on the challenges of daily life. However, life was not always smooth sailing for Gangamma. Born in Hukumpeta in Araku, a hill station in Andhra Pradesh, Gangamma lived a hand-to-mouth existence with her parents who were uneducated but had big dreams for their daughter. Encouraged by their belief in her abilities, she continued, completing her early schooling in a government school. With no good secondary school located close to home, she then had to transfer to a High School located far away. This meant she had to walk two hours every day through rocky and inhospitable terrain. Yet, the confident young girl persevered, becoming the first person in her family to venture out of their village. Tragedy soon struck as Gangamma’s father passed away when she was in Class VIII but while other girls would have buckled under the weight of this enormous misfortune, Gangamma kept her feet on the ground and kept moving towards her goals. Her mother began working as a daily wage labourer to help fund her education. This is where Project Nanhi Kali stepped in. Established in 1996, and jointly managed by the K. C. Mahindra Education Trust (KCMET) and the Naandi Foundation, with the aim of providing education to underprivileged girls in India, the programme has helped fund the education of 310,000 girls so far. These girls usually hail from remote tribal and rural areas and urban slums across 11 states in India. The Project works to ensure that every girl receives 360-degree support that provides after-school classes, for Language and Maths. 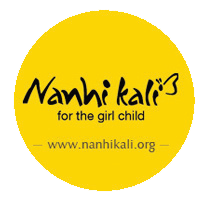 In addition, a school supplies kit comprising of a school bag, shoes, books, uniform and even feminine hygiene material is provided to every Nanhi Kali, every year, allowing her to go to school with dignity. Social support involves working with parents and communities to counsel them on the importance of sending their girls to school. The girls in secondary schools are provided digital tablets preloaded with audio and video educational content. This major undertaking has been made possible thanks to 4,230 Community Associates who tutor Nanhi Kalis across 4,963 Academic Support Centres of which 4,132 are housed in government schools and 831 in community spaces across 11 states in India. The Community Associates and Nanhi Kali Coordinators also spend time with parents and community members to sensitise them about the importance of education for the girl child. Project Nanhi Kali provided Gangamma with necessary support to help her continue her studies. This included school supplies and extra classes which were completely free of cost. She also benefited greatly from the tutoring offered by the Nanhi Kali Community Associate, which helped her pass her Std. X Board exams and obtain admission in the Science stream. The spunky girl then went on to complete intermediate studies from the Andhra Pradesh Tribal Welfare Regional Junior College. Thereafter, an ambitious Gangamma enrolled herself in the Bachelors of Science course but fate intervened yet again. Lack of financial support eventually forced her to drop out and she decided instead to train at the Government College of Physical Education. Unfazed, she maintained a positive attitude and eventually got her first job as a physical education trainer. “It’s very gratifying to see young girls being supported by Project Nanhi Kali as they can not only continue their education but can also avail of the right guidance. A lot of people credit my willpower for the milestones I have achieved, but it was also the help provided by Project Nanhi Kali as well as my mother’s support and encouragement that kept me motivated and allowed me to make the most of every opportunity,” says a visibly proud Gangamma. Gangamma’s story is a validation of the successful model pioneered by Project Nanhi Kali which has empowered countless girls to educate themselves and find employment – girls like Gangamma who gain the confidence to take on every challenge that may come their way with courage, passion and conviction. Copyright © 2018 Mahindra & Mahindra Ltd.